By Sunday evening our group of ten had been reduced to six as Val and Patty S. and Ange and Arlene C. had previous commitments. Fortunately, the remaining sextet were more than capable of combining fine food and good wine at another nice BYOB at the Jersey shore. 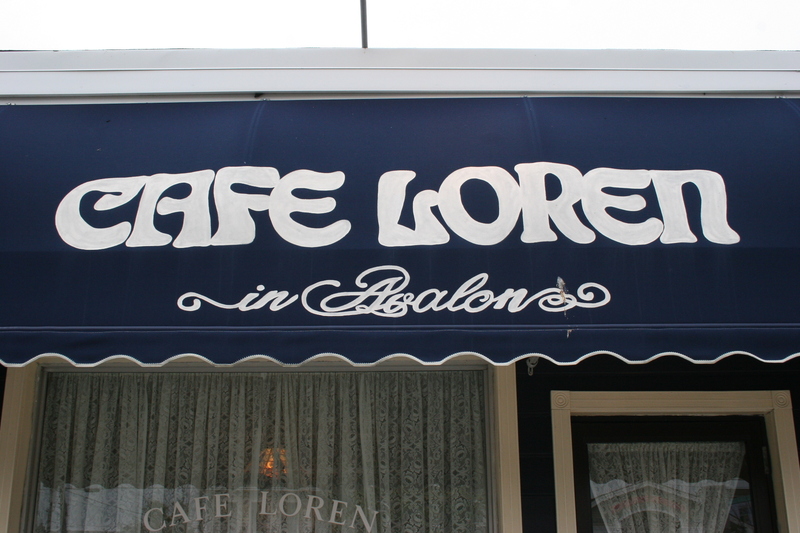 Tonight’s choice was Cafe Loren in the heart of Avalon 23rd Street and Dune Ave. The place has been an Avalon institution for 33 years but this was my first visit. The two room dining spot is decorated in calming shades of blue and it’s a perfect beach decor. We had three nice wines for the evening and our server, Brad, opened them for us as he recited the evening “specials”. Joe B., our Malbec fan, brought with him a 2008 Gascon, Malbec, Reserva, Mendoza, Argentina. This is another in a long line of deep, dark, fruit-driven wines from South America. I went with a 2006 Phillips Hill, Touluse Vineyards, Pinot Noir, Anderson Valley, CA. A great wine with fish, the subtle fruits and soft tannins helped me greatly in choosing my entree and appetizer. 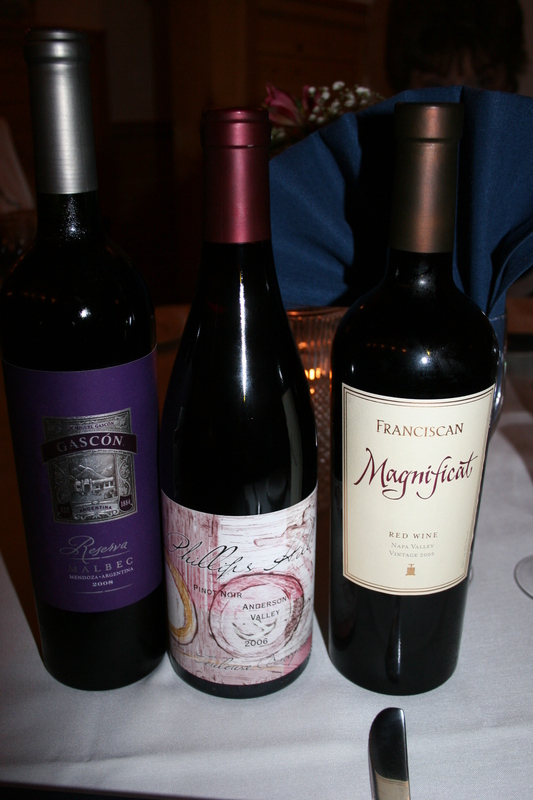 Jerry B. brought one of the always dependable 2005 Franciscan, Magnificat, Napa Valley. Bright berry flavors, hints of chocolate and licorice and a long, smooth finish make this a great wine for any setting. As the bread was being passed around the six of us focused on our appetizers . 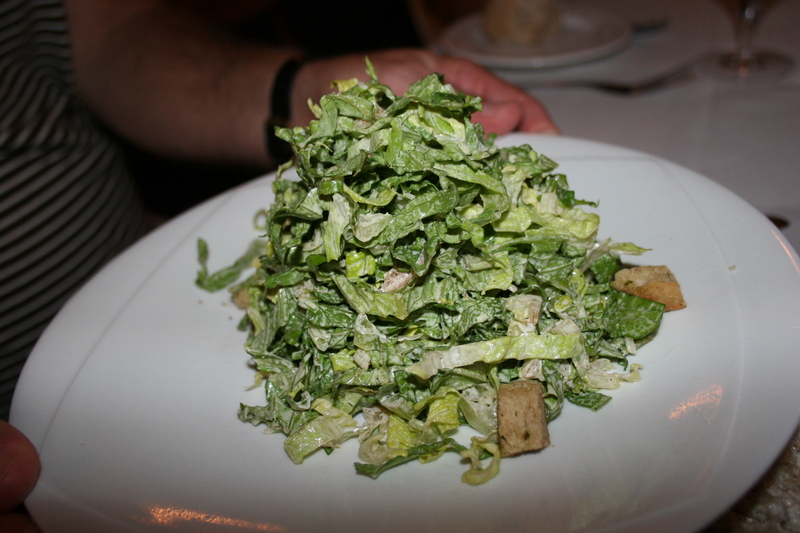 Carol B. chose the Caesar Salad, and although I thought the presentation looked very nice she found the salad to be bland. So much so that she asked for more dressing which did little to improve the offering. She termed it “disappointing”. 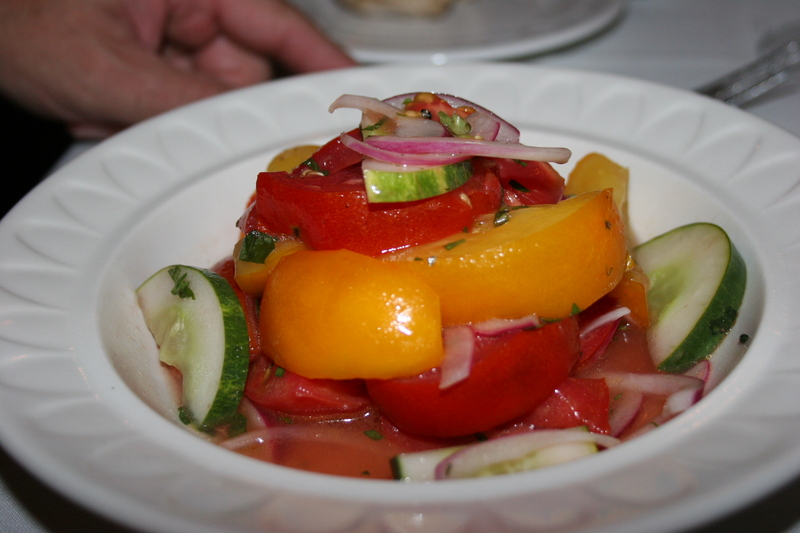 Equally disappointed was her husband, Joe, whos e selection of the Jersey Tomato Salad was far from “special”. He pointed out that the tomatoes were very cold and that Jersey tomatoes should never see the inside of a refrigerator. A lifetime of experience in the produce business certainly gives him the credentials to recognize the shortcomings of a tomato salad. Jerry B. had the same salad and also felt it was lacking. My wife, Kathy and I, fared considerably better with our choices. 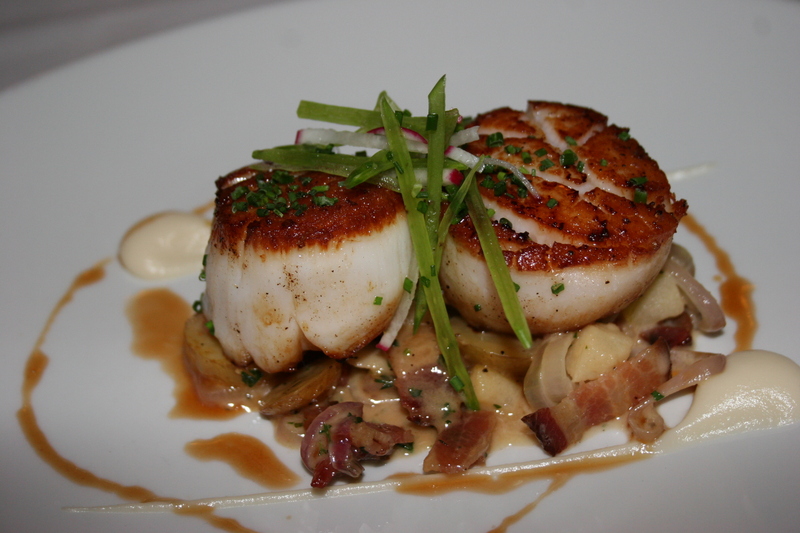 Our pan-seared scallops with smoked bacon, potato and apple hash, silky cauliflower puree and sherry shallot gastrique was excellent. The scallops were large, perhaps mine slightly larger than hers as she was quick to point out, cooked perfectly and full of flavor. My meal was off to a good start. 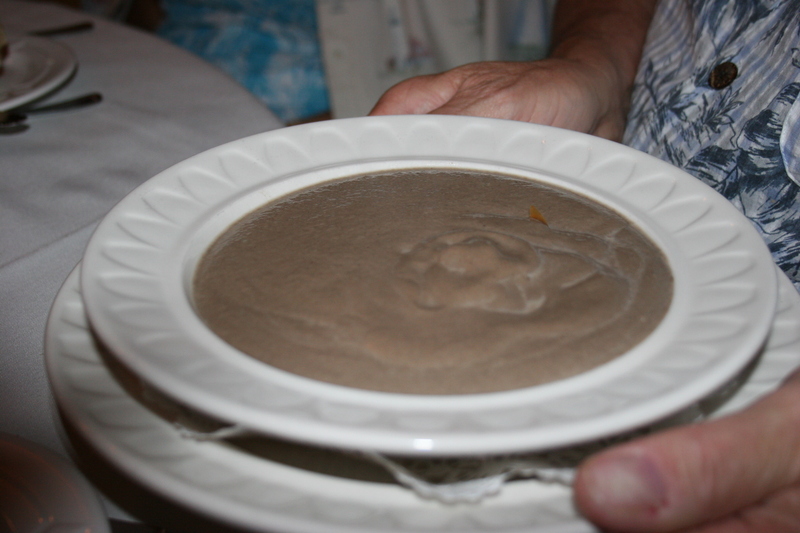 JoAnn B. ordered the Wild Mushroom Soup and although I would not have picked that even on a double dare, she thought it was tasty. I’m not sure where I got this mushroom phobia but it seems to be pretty deeply engrained in my head. When it came time to select our entrees, Kathy, Jerry and Joe were all on the same page with the Sauteed Jumbo Lump Crab Cakes, on a bed of sauteed arugula, roasted peppers, shitake mushrooms, grilled asparagus and lemon-caper aioli. 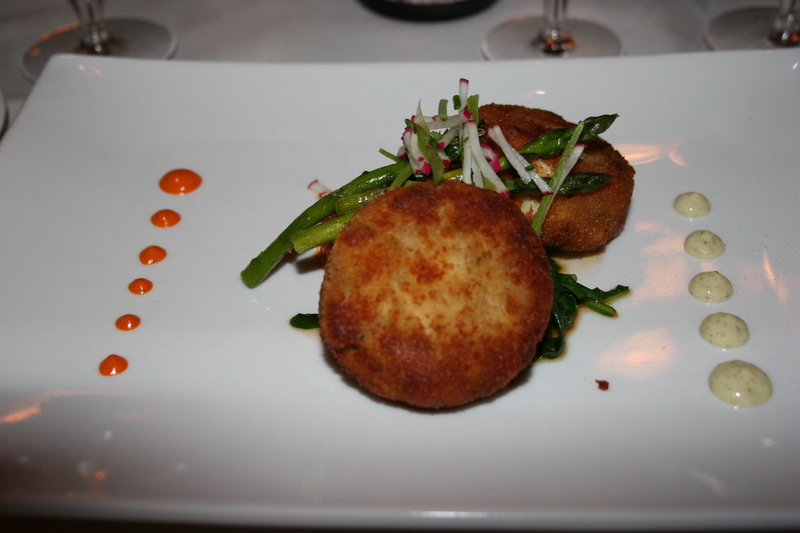 The presentation was lovely and the crab cakes nicely done. I heard no complaints from any of the trio of crab lovers. 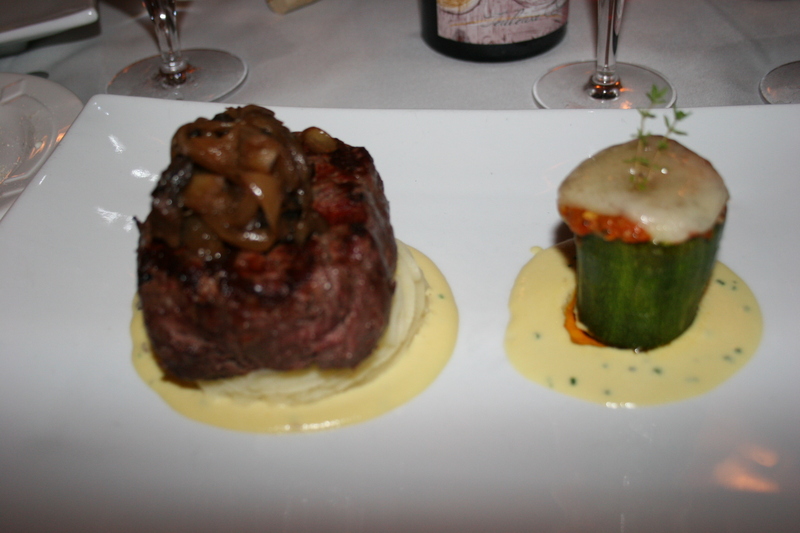 Carol B. must have not had her fill of steak last night because once again she chose the Grilled Filet Mignon, carmelized onions vegetable and manchego cheese stuffed zucchini, roasted garlic Yukon mashed potatoes and red wine reduction. This was another beautifully presented dish and Carol thoroughly enjoyed it. 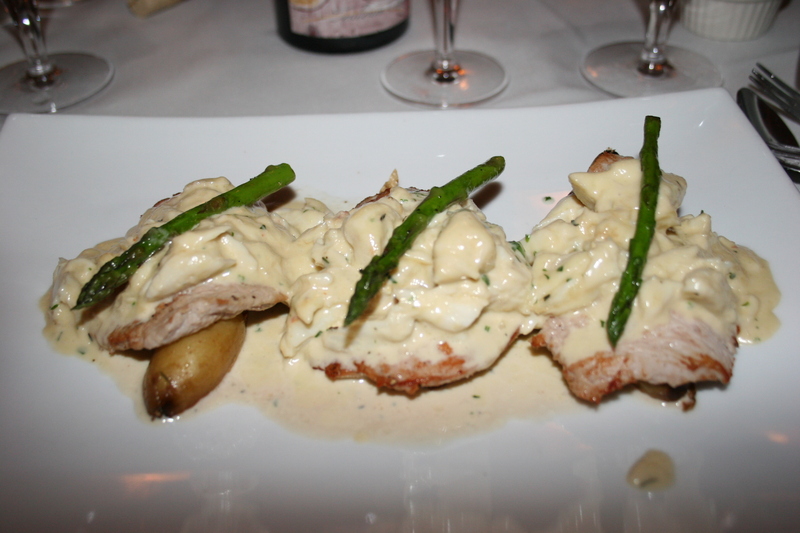 Joann’s entree was the Veal Larousse, medallions of veal in garlic cream sauce, sauteed jumbo lump crab, asparagus tips and olive oil poached potatoes. Another classic looking presentation. Obviously someone in the Cafe Loren kitchen knows something about what a finished dish should look like. Joann emphasized that her sauce was good, the crab was VERY good, but the veal itself was distinctly lacking in flavor. This one came under the heading of “looks can be deceiving”. I hit a bullseye with my selection of the Black Pepper & Coriander Crusted Wild Scottish Salmon, chick pes & hummus salad and cumin yogurt sauce. 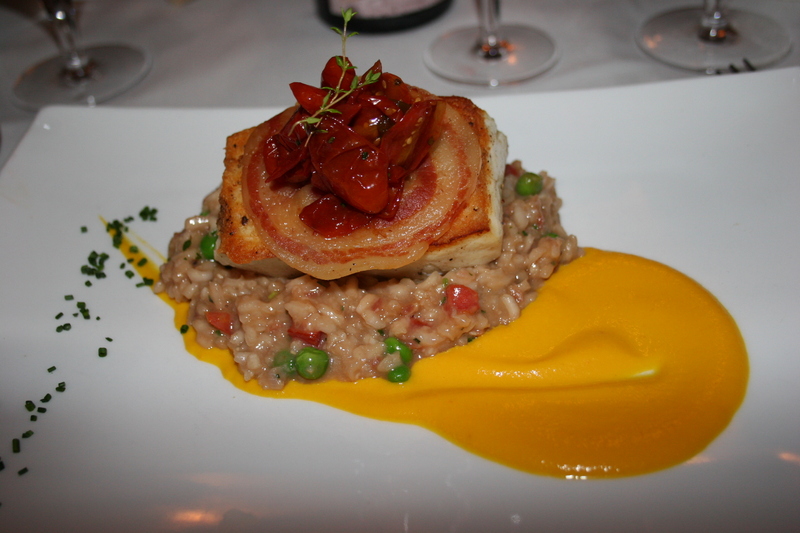 It looked so pretty on the dish that I wasn’t sure if I should eat it or have it matted and framed. Fortunately, I decided to eat it and it was delicious. I was very happy with both by appetizer and my entree. I know some of the others were a little disappointed and the prices are a bit on the high side, even allowing for “seashore dining inflation”. Brad, our server for the evening, did a good job, he was attentive and charming. We decided to skip dessert, said goodbye to Joe and Carol who had to head back home, and went to Springer’s in Stone Harbor for ice cream.